Many individuals do not realize that muscles play an important role in dentistry. The science of Neuromuscular Dentistry (NMD) evaluates and treats your overall oral health by considering how your muscles, teeth and joints all work together. Your jaw posturing muscles may be over worked in attempting to maintain your present “programmed” position, even when you think they are relaxed. Head posture can also affect your occlusion and muscles that control head posture are primarily in the neck and upper back. Taken together, these conditions can lead to a variety of problems including a less than ideal bite, muscle pain or dysfunction, or jaw joint problems. The Neuromuscular Dentist determines the jaw position that is associated with relaxed posturing muscles and adjusts or alters your occlusion (bite) to that position. Your smile is the first thing that most people notice about you, it can have a dramatic effect on how old people think you are! 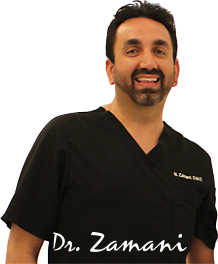 Because of this Dr. Zamani has spent the last 20 years refining the natural beauty that he is able to achieve using his unique approach. Because the muscles controlling the jaw are subconsciously “programmed” by the brain, most individuals have difficulty consciously reaching a truly relaxed state. To help your muscles reach that relaxed state, a device called the Myomonitor is used to deliver gentle electrical stimulation to your muscles. The Myomonitor is a battery operated electrical muscles stimulator. Mild electrical stimulation is delivered through adhesive patch electrodes attached over nerves that control specific muscles groups. The virtually painless stimulus delivered by the Myomonitor will cause our facial and jaw muscles to twitch or pulse once every one and one half seconds. After about 40-60 minutes, this electrically induced “exercise” will allow your muscles to overcome their programming and go to a relaxed state. If there are indications that head posture may be affecting your occlusion, the dentist may also use the Myomonitor to stimulate and relax muscles in the neck and upper back. Now that your muscles are relaxed, the Neuromuscular Dentist will confirm and record the relaxed position of your jaw by placing a fast setting putty-like material between your teeth. The doctor can now compare our usual occlusion (bite) with the relaxed jaw position to evaluate if your jaw is presently in a near optimal position and determine whether the occlusion should be adjusted. IS NEUROMUSCULAR DENTISTRY FOR YOU? There are often options to consider when you are choosing dental treatment. After initially evaluating your situation, your dentist or treatment counselor will discuss those options with you. NMD becomes one of your options when or if you are contemplating aesthetic, cosmetic, reconstructive or orthodontic dental procedures. Additionally, NMD techniques are used to treat patients that suffer from TMJ-like symptoms and to aid in establishing the occlusion for dentures. It is in these cases that establishing the optimal occlusion becomes so important. This is when choosing neuromuscular techniques may have a substantial and positive impact on the outcome of treatment. The relaxed jaw position gives your dentist an added insight that may allow for a faster completion and improve final treatment results. Feel free to discuss these options further with Dr. Zamani to determine if Neuromuscular Dentistry is right for you.